NUMB on a plane! 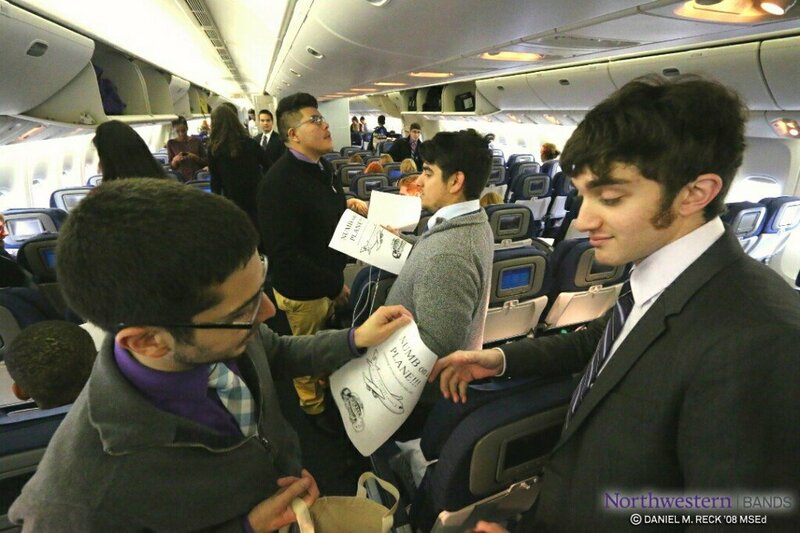 Per tradition, SpiritSheets are distributed to the aboard the plane and the band sings "Go U, Northwestern!" during take off. Photo by Daniel M. Reck '08 MSEd. "It is a Big Ten tradition to honor our opponents with their song," Farris reminded his students. "Let's take that again from the top." Wed., Dec. 30 at around 12:30 p.m. Thu., Dec. 31 at 2 p.m. The Northwestern and Tennessee bands will have a friendly face off at Busch Gardens. Regular park admission applies. Thu., Dec. 31 at 5:30 p.m.
NUMB steps off for a parade in Ybor City, followed by a pep rally on Seventh Ave. around 6:30 p.m.
On Fri., Jan. 1, game day finally arrives, with several more performances. Some may require tickets or admission. “We follow Tennessee in both pre-game and halftime," says Farris. After the Wildcat Band's half time show, several Florida high school bands will unite to give a massed performance. "This is going to be a great trip," says Farris. "You've earned it." Fans may find Wildcat Football on Facebook and on Twitter as @NUFBfamily, they also find Head Coach Fitzgerald on Facebook and Twitter, Be sure to also follow Twitter hashtag #B1GCats for the latest Wildcat athletics action. Photos and gifts purchased from the official bands photo gallery support digital media coverage of the band program.